Come for a dining experience to remember at a family-friendly venue at the foot of the Blue Mountains. Recently awarded the Best Schnitzel in Penrith, The Pioneer Tavern is well known for its schnitzels that are hand crumbed and prepared in-house. With three sizes to choose from, being regular, big and huge, they cater to everyone’s appetites. They also have a huge range of schnitzel toppers with 21 to choose from. Some of the most popular include the classic Parmigiana with ham, Napoli sauce and melted mozzarella or for something creamy, try the Valdostano with bacon, mushrooms, cream sauce and melted mozzarella. If you need a little bit more spice, the Moo-Ha-Ha is the way to go with corn chips, chilli con carne, sour cream, guacamole, salsa and melted mozzarella. If steak is more your thing, they offer delicious T-bone, rump and scotch fillet cooked to your liking. There are plenty of specials to be had with a $12.50 lunch time offer available every day and nightly specials. Join them on a Monday night for a $12.50 big schnitzel with a choice of three toppers, or on Wednesday night you can grab a $12.50 surf ‘n’ turf. Come in on Thursday night for a $15 schnitzel with the choice of any of their great toppers. The bistro is open every day for lunch and dinner, and on Saturday and Sunday from 9am for breakfast. Boasting both indoor and outdoor seating you can dine anywhere throughout the venue. Keep an eye out for their new winter menu coming soon. The team at The Pioneer Tavern pride themselves on outstanding service, food presentation, good value and quality offers. It is the perfect place to have dinner with the family in a relaxed atmosphere or to catch up with some mates for a meal and to have a cold drink. 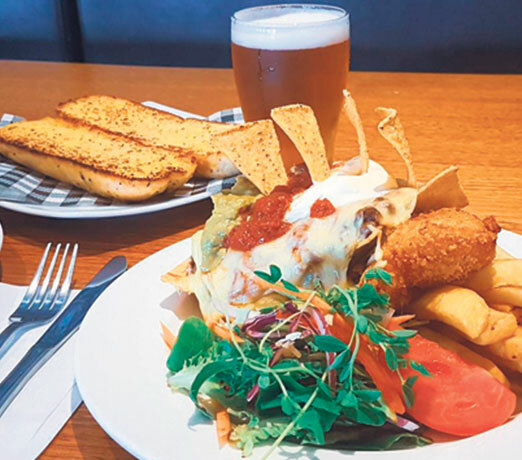 The Pioneer Tavern is easy to get to, located just off the Northern Road in Penrith, close to Orchard Hills, Jamisontown, Glenmore Park, Emu Plains and South Penrith. It’s minutes from the M4 and easily accessible via public transport with buses frequently stopping just minutes away.